Not all social media platforms are the same, so posting on social media is not the same across all platforms either. There are a few important steps that go into constructing the perfect social media post. These steps are important because they are allow you to maximize every aspect of the social media platform. Taking advantage of all of the platform’s features when posting will help your business appear higher up on user’s news feeds and increase engagement. The dimensions for an Instagram post is 1080 x 1080 pixels. However, Instagram now allows for posts to be either vertical or horizontal, but they should have an aspect ratio between 1.91:1 and 4:5. It is important to think about how the image is going to look once it is made smaller on your feed. It is best to share beautiful photos of your products, services, business, city, quotes, and even short videos. Boomerangs can also be taken through the app and they are short, fast-moving images that are a fun different way to show content. Instagram has a new carousel feature where you can upload more than one photo at a time, and you are able to scroll through them once they’ve posted. To create a more cohesive Instagram feed it is best to stick to the same filter and editing styles for all of the photos that are posted to the feed. Choose between two filters at most. This will help the colors and brightness of the photos look cohesive, and the feed will be consistent. Geotagging on Instagram is a great way to save where the photo was taken. 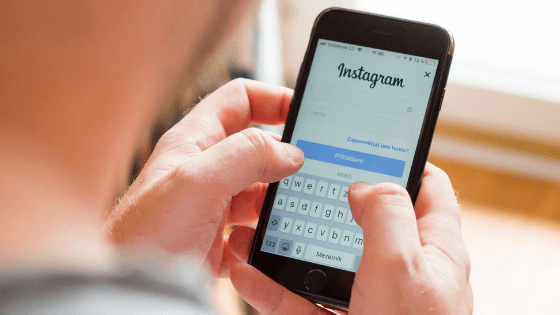 Adding a location to an Instagram post allows for the post to be found when someone searches for that specific location. Tagging brands and businesses that are in posts are a great way to reach them and their followers. This will help increase engagement on the post, because followers searching and engaging with this brand will find your post. Even though a picture is worth a thousand words, the caption is still a very important part of posting to Instagram. It is a good rule of thumb to post short and long captions sparingly and not to stick to just one style. Use the “return” button on the keyboard to go down to the next line to break up the big paragraph of text. Instagram allows for you to use up to thirty hashtags on your posts and you should be using all thirty. Be sure to only be using relevant hashtags towards the content in your post, your business or industry. You want to be using a good mix of popular, industry, and location hashtags. It is important to remember when you are usually on Instagram when it comes to posting, and when you aren’t so it allows for people to see your posts at “uncommon” times. Around noon is best. You should be posting at least once a day, but no more than twice a day. 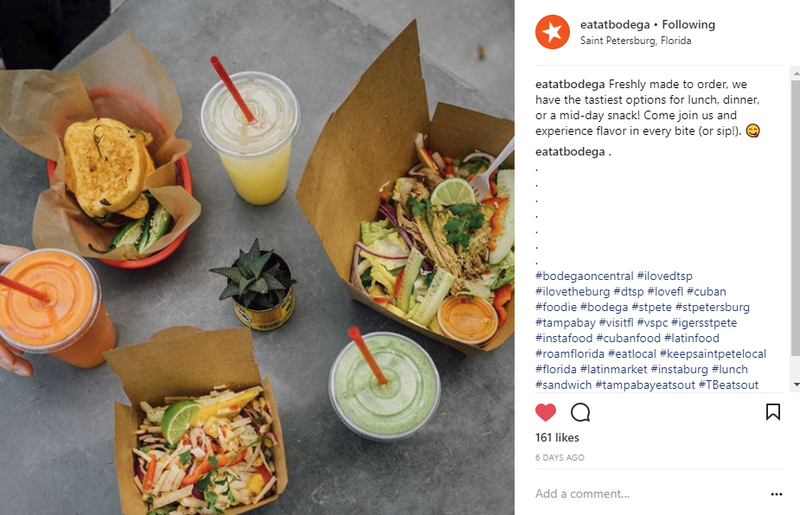 Above is an example of an Instagram post from Bodega that is utilizing all of Instagram’s posting features. 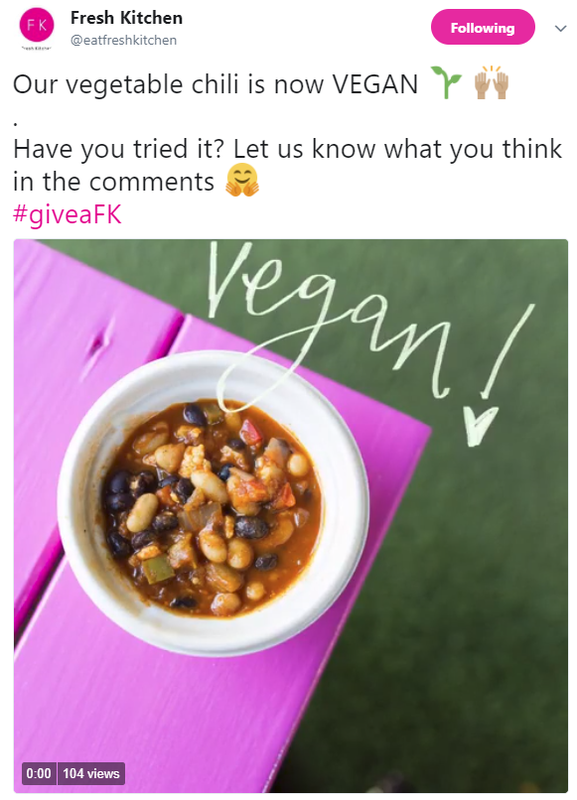 They have shared a high quality photo of their product, included the location, wrote a catchy caption, and included popular, relevant, and location hashtags at the end of the post. The dimensions for an image shared on Facebook are 1200 x 630 pixels. Facebook also allows you to add more than one photo to your posts so it is important that all of the photos are the same size. Post a variety of content including pictures, videos, blog posts, and polls. Make sure that all of the content you create is branded with your business’s colors and add your logo to graphics if it doesn’t make the picture to busy. On Facebook, it is important to share genuine content that your followers can engage with. Ask them questions or tell them to comment about a topic in your industry. Whether you are sharing content from another brand or posting about a business or product, always tag the brand in the post to gain more exposure. This will also help your followers explore that brand or business. Hashtags are not necessary on Facebook and do not function as they would on other platforms. The only exception to this rule is if you include a branded hashtag for your business or a campaign. By creating a branded hashtag you will be able to easily track when it is being shared. 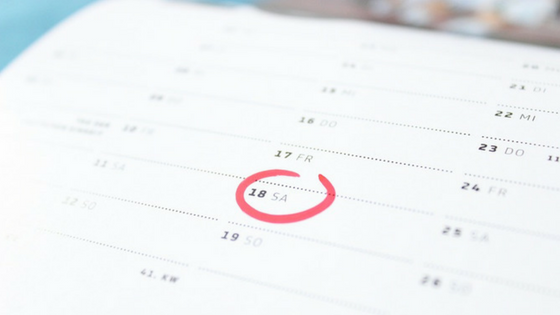 The best time to post on Facebook is 1-4 pm, and the best days to post for higher engagement are Wednesday through Friday. However, you should always be checking your insights and analytics for what times work and don’t work. 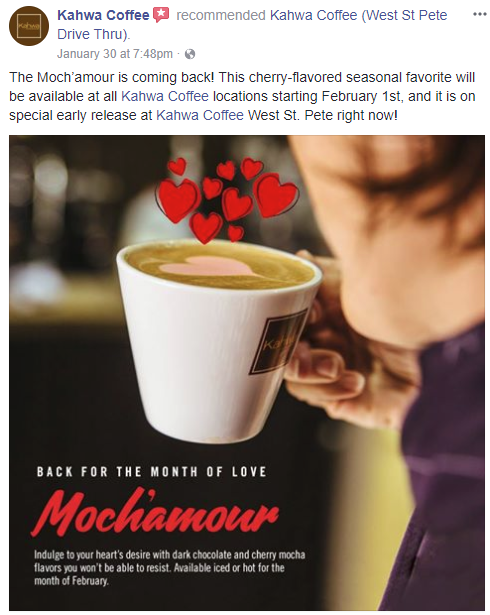 Above is a Facebook post from Kahwa Coffee on their Valentine’s Day special. They included the location, detailed caption, branded graphic and they even tagged their brand when mentioned. This will help the reader be able to easily locate the business’s Facebook page since it is linked. They also created a branded graphic that included text for any reader that might have skipped over the original caption. The dimensions for an image on Google Plus are 250 x 250 pixels. Google+ is a great platform to share a variety of content including pictures, videos, blog posts, articles, and links to your website. Make sure graphics that you have created are branded with your brand’s colors and logo. Hashtags work great on Google+ and you can include as many as you would like. It is a good rule of thumb to only include industry related hashtags on your posts and group them together at the end of the post. The best times to post on Google+ are weekday mornings from 9-11am. Wednesday is the best day to post, so expect engagement to be higher on this day. The dimensions for an image on Twitter are 440 x 400 pixels. However, you want to make sure that the content of your image will not be affected if the image is cut off because Twitter will resize the images based on how many you add to the post or if you include a link. The best content that should be shared on Twitter includes text only tweets with quotes, facts, or questions, photos, short videos, and polls. It is best to be posting a mix of content rather than just one format. Retweeting other Twitter users and quote tweeting are other great ways to share content. Twitter has now increased the character count on tweets from 140 to 280 characters. Even though the word count is higher it is still best to not max out the word count every time. The character count is up to 280 characters on Twitter, so it is best to avoid using up the majority of the character count with a link. A helpful tool such as Bit.ly can shorten and even track links. Hashtags were made popular by Twitter, and the recommended amount of hashtags per tweet is two to three. These tweets see better engagement than tweets with fewer or more. Group the hashtags at the end of your post to make them less distracting when trying to read the text in the tweet. The best time to post on Twitter is anytime during the day between 9am and 3pm. For maximum retweets, the time to post is 12pm and 5pm. A great time to share links to articles or blog posts is around 3pm. This will ensure high click-through-rates. Above is a Tweet from Fresh Kitchen, that maximizes all of Twitter’s posting features. This Tweet has a short video that is on brand, branded hashtag, and a catchy caption that includes a question for the reader. 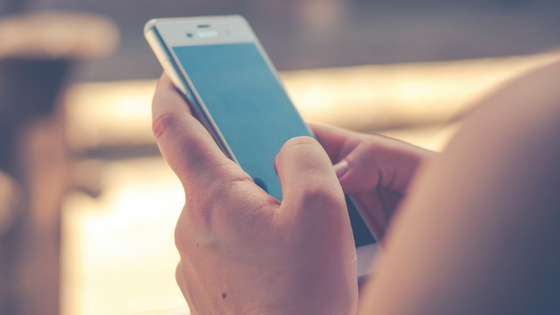 A great way to boost engagement is by adding a question or a call-to-action! When pinning images to Pinterest, the recommended image size is 735 x 1102 pixels. It does not matter how tall a graphic is, because Pinterest works well with different length graphics. Pinterest is a great platform for you to share both pictures and infographics. It is important that you only create boards and pins that are related to your business and industry. A few photos to share would be infographics about data from your industry, blog posts, or appealing graphics with branded text. Pinterest users do not like pinning graphics with faces. Avoid sharing photos with faces or cut them out of the picture. All pins on Pinterest have the ability to be linked to an external website. If you are pinning a blog post include the url for the post, or if you are creating pins related to your business then include your website url. It is ok to create multiple pins linking to the same blog post url. Keep captions short and sweet on Pinterest, and remember to use important keywords that are going to help the pin get found in search results. It is best to avoid long text in captions because they aren’t going to be read. Pinterest is best described as a search engine, so hashtags work great on pins. Hashtags are a great addition to any caption, but include them all together at the end. It is best to include only related hashtags on pins, but the number allowed is infinite. The best times to pin to Pinterest is on Saturday from 2-4am and 8-11pm. It is best to pin five to ten times a day, and you can even use a scheduling software to schedule pins such as Tailwind or Boardbooster. When it comes to posting on social media, it is important to remember all of the steps depending on what platform you are posting too. 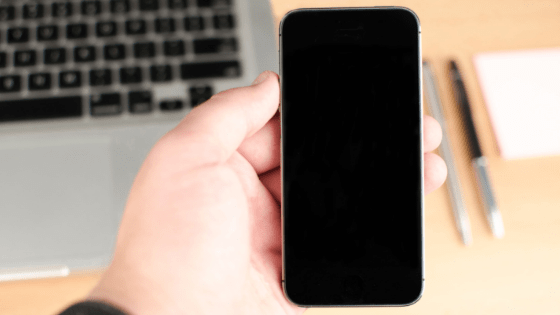 This will help you utilize the platform to its fullest extent. increase brand awareness, and engagement. If your small business needs help with managing its social media presence, contact us today at info@kapokmarketing or (727) 214-5844 to see how we can help.